distribution Statewide, with only three counties (two in the mountains) lacking records. Obviously occurs in all 100 counties. abundance Common and widespread in the Coastal Plain and Piedmont, and can be very common at times in the Coastal Plain, especially close to the coast. Fairly common in the mountains. flight In the Coastal Plain, it flies almost throughout the odonate flight season -- very late March to mid-November; however, not numerous in the spring. In the Piedmont, it also begins in late March, but the latest date is just mid-October. In the mountains, it has also been seen as early as late March, but the last date is in late September. habitat Breeds at ponds, lakes, marshes, and other open, still waters. behavior Males are often seen flying over ponds and lake margins, usually higher above water than other species, and perching on twigs farther from shore than most species. Adults are most frequently seen in gliding flight well above head height, typically 8-15' off the ground, usually over open country. They seemingly can stay airborne for an hour or longer, and observers often get impatient waiting for such an individual to come to a perch. 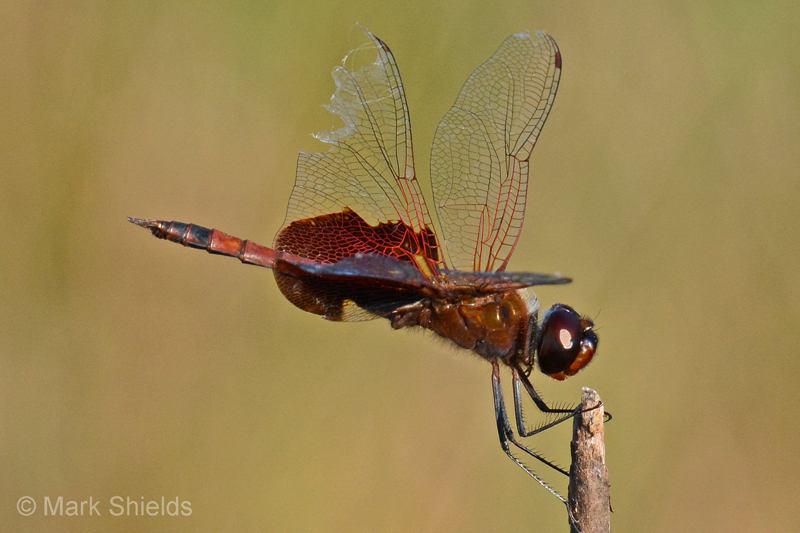 comments This and the Black Saddlebags are frequently seen gliding over one's head when an observer is walking near the beach, or in a field, or in an open garden, or near a large pond. The two can be difficult to distinguish until they appear in front of a dark background and the observer can see the abdomen color (or the large pale abdomen spot of the Black Saddlebags). This species is partially migratory, as large numbers can at times be seen along the coast in fall. Comment: Richmond; C, 2015-05-03, - Never uncommon, several spotted at various sandhill bodies of water. Comment: Carteret, 2003-06-26, FOMA - Common flying around outer fort walls.